The Black Gold Regional School Division (BGRS) hosted a Leadership Symposium on Thursday, November 6, 2014. 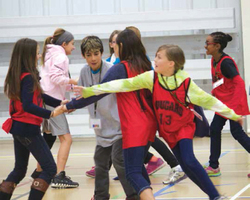 A total of 140 students, teachers and parents from Black Gold schools attended the BGRS Student Leadership Symposium at the Leduc Recreation Centre. This is the second BGRS initiated student leadership event to occur within the last three years. With an eye towards understanding and addressing wellness across all curriculum, the goal for this symposium is to bring about a culture where parents, teachers and students value and practice active living, healthy eating, and positive social environments throughout the student learning process. By recognizing how health and wellness impact learning, members of the school community will individually and collectively experience and embrace positive changes that will improve students’ educational outcomes and wellbeing. Students attending the Symposium came from Grade 4 to Grade 12 and were representing their school’s Leadership programs. They were welcomed by Superintendent Norm Yanitski and provided a conference overview by Thorsby Elementary School’s Assistant Principal Erik Larson. Keynote speaker, Dr. Doug Gleddie, gave the opening address. Dr. Gleddie is an Assistant Professor at the University of Alberta in the Faculty of Education. He has studied the role of how play, fun, and joy can enhance a student’s ability to learn. He relates a number of narratives on intrinsic motivation and how to, “turn the switch” on students in physical education at both the elementary and post-secondary levels. The Symposium, after a wellness break, then split up into a number of breakout sessions. The sessions were designed for the various age groups and ranged from different types of physical activities, dealing with stress, building healthy relationships, to developing leadership skills. After the breakout sessions, representatives had an opportunity to develop a school action plan for their school. The plan will be taken back to each school’s leadership class and then, after further input, adopted for action. At the end of the school year the plan will be reviewed and evaluated for results. During the Bag Lunch, Bill Gordon gave a talk about the ‘Power of Kindness’. A central theme of the talk is to, ”Practice random kindness and senseless acts of beauty.” Gordon is a teacher and counselor with Elk Island Public Schools. He has traveled across Canada speaking to thousands of students, teachers and parents on topics such as self-esteem, communication, parenting, suicide prevention and the power of kindness. The Symposium ended with the closing remarks from Cheryl Hafso, Principal of the New Sarepta Elementary School.